IMAGE SIZE: 7/8" x 2 5/16"
The Traxx Self-Inking stamps feature heavy-duty construction and an ergonomic shape with a full index label. They have been tested for over 100,000 impressions. They are easy to use and the easiest to re-ink, with a convenient slide out ink pad. They re-ink with regular rubber stamp ink, no special inks are required, and perform for thousands of stampings between re-inkings. Traxx Self-Inking stamps are suitable for high volume use. The ink pads are replaceable with standard Trodat/Ideal 4913 pads. Your stamp is custom made in-house by our craftsmen to make your stamp look and perform at its best. Choose from the eight popular type styles shown below and one of six colors of ink. Your stamp will be provided fully inked and ready for use. 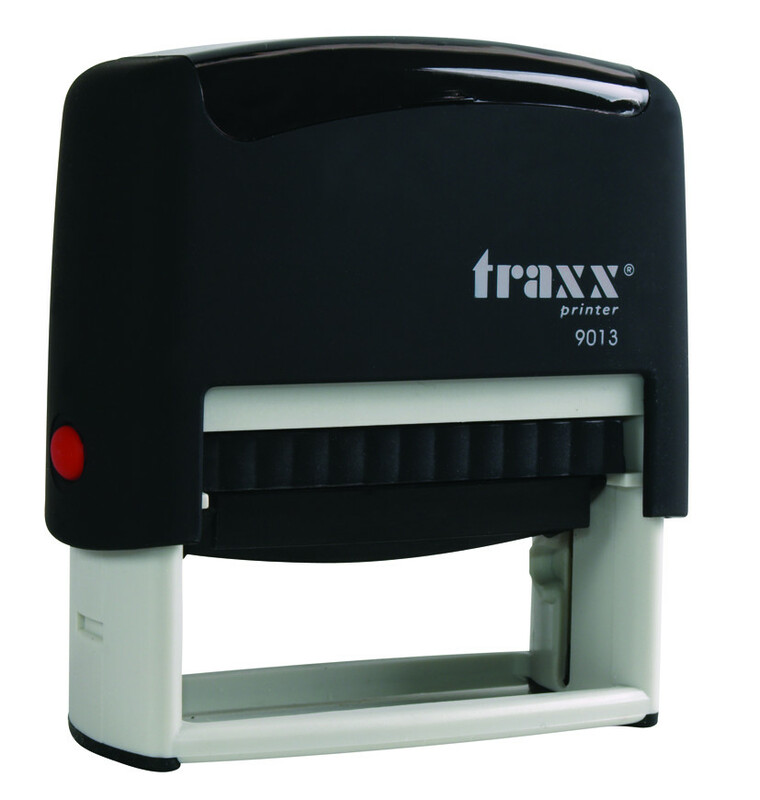 Traxx Self-Inking stamps are not suitable for use on glossy surfaces. Send us a message thru the ebay messaging system to tell us what you would like to say on your stamp and specify the type style and ink color. The exact wording you would like on your stamp, up to five lines of text. Say whatever you like! Please limit the number of characters per line to 30 or less. Type style: Choose one of the styles shown above. If no type style is selected, Style 1 will be furnished. We will condense the type slightly if necessary to fit. Ink color: Black, Blue, Red, Green, Purple or Brown. If no ink color is selected, Black will be furnished. IN ORDER TO SHIP YOUR ORDER WITHIN 24 HOURS. Excessive delays in receiving this information may force us to cancel your order. Payment: We prefer payment via Paypal. To Get Help: We are here to help you before and after your order is placed. If you have any questions you may contact us thru the ebay messaging system. Why Purchase From Us: We have been in business over 42 years, have an A+ Better Business Bureau rating and many thousands of satisfied customers. We pride ourselves on fast service and excellent customer support.